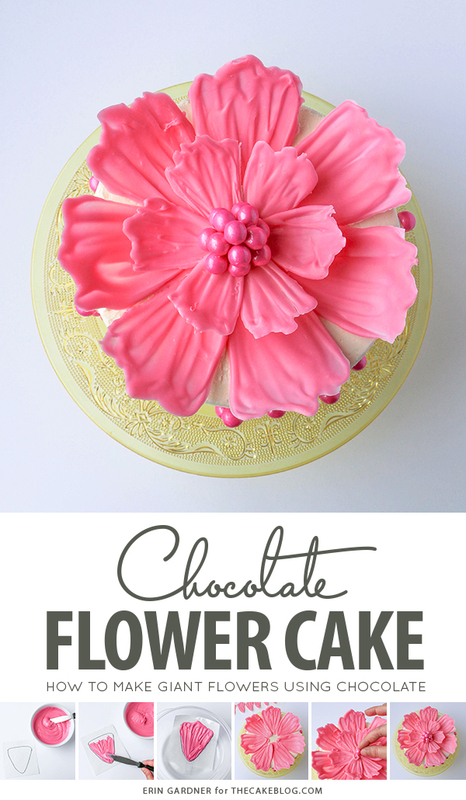 Chocolate Flower Cake – how to make a giant chocolate flower cake, using candy melts and everyday tools. A new tutorial by our contributor, Erin Gardner! My obsession with chocolate flowers continues! 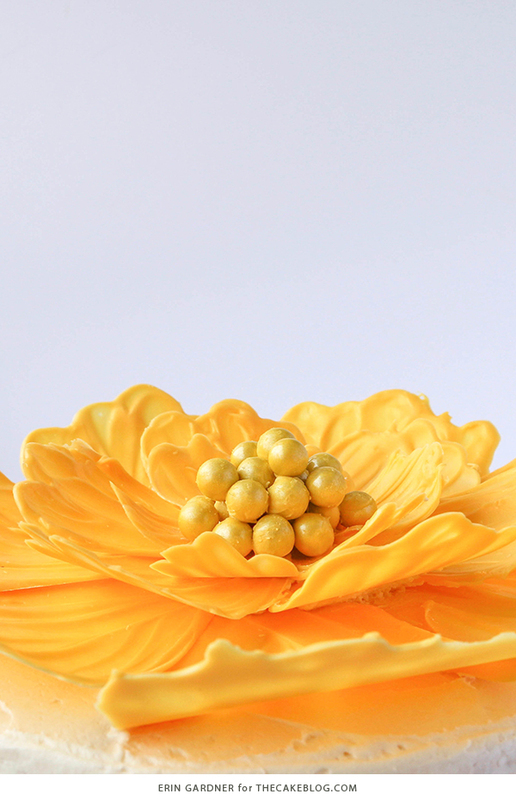 What could be better than a delicious and beautiful chocolate flower? A GIANT chocolate flower, of course! 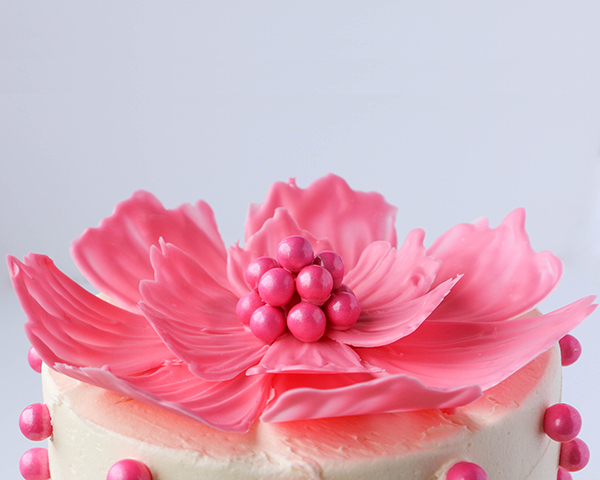 Arranged on top of a cake to create a spring dessert pretty enough for any special occasion. 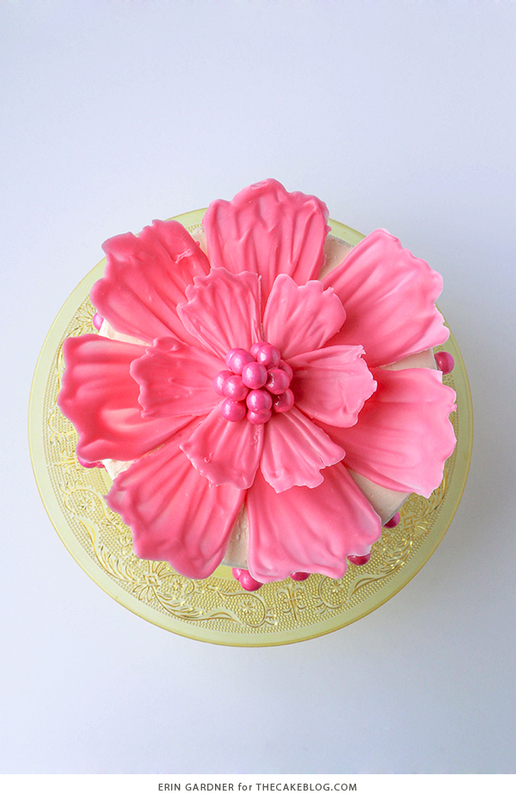 From Easter to Mother’s Day, birthdays to bridal showers, today’s Chocolate Flower Cake is sure to impress. 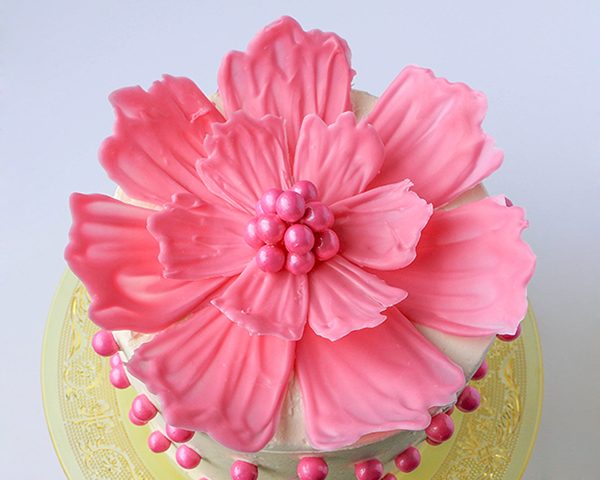 These blossoming beauties are a fun and easy way to quickly dress up buttercream iced cakes. Use a few simple ingredients, and tools you probably already have around the house, to create a stunning spring-inspired cake garden. 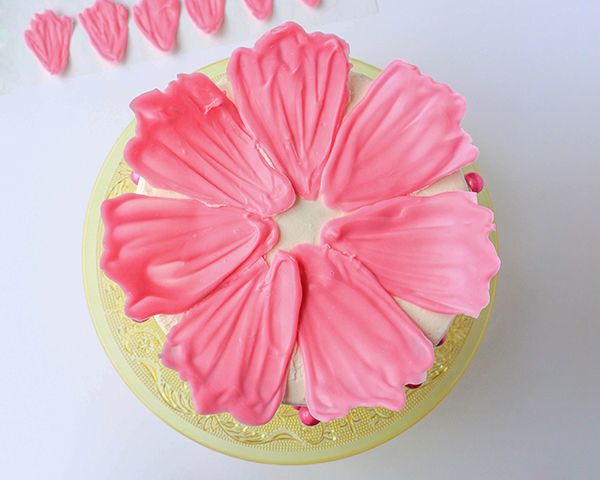 These techniques could just as easily be used to create smaller flowers for the tops of cupcakes. 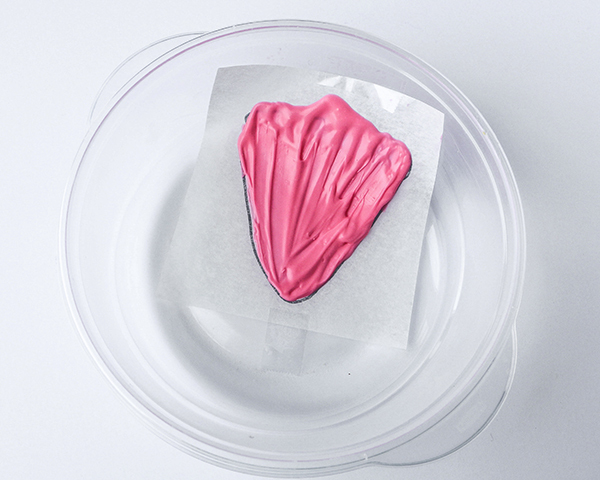 Create your delicious buds with tempered white chocolate tinted with candy coloring or cocoa butters, or keep it simple and use candy melts — either works beautifully. 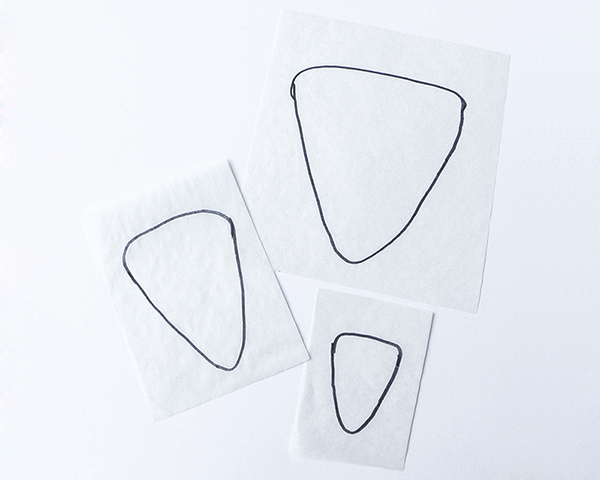 Use a black marker to draw triangles on parchment paper in various sizes. These triangles will serve as a guide for creating your chocolate petals. For an 8-inch round cake, I used three sets of triangles, approximately 2, 3, and 4 inches long. 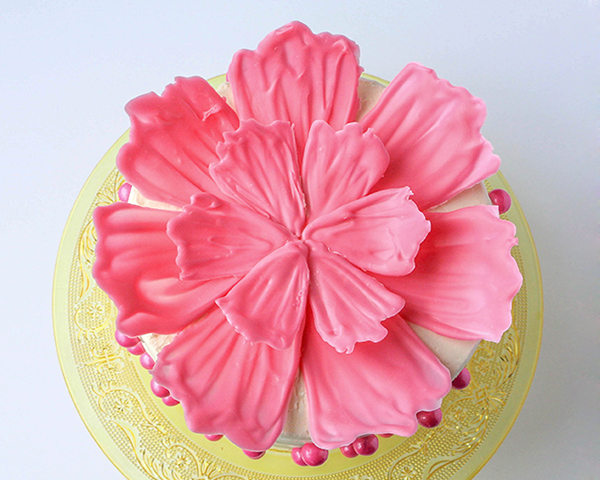 For a 6-inch round cake, I made two sets of petals using the 2 and 3 inch triangles. It’s easiest to work on petals individually, so cut the templates out leaving about a 1/2-inch space all around the outline. Melt and temper chocolate, or melt candy melts, in a small heatproof bowl. Flip the pieces of parchment paper over before spreading on the chocolate. 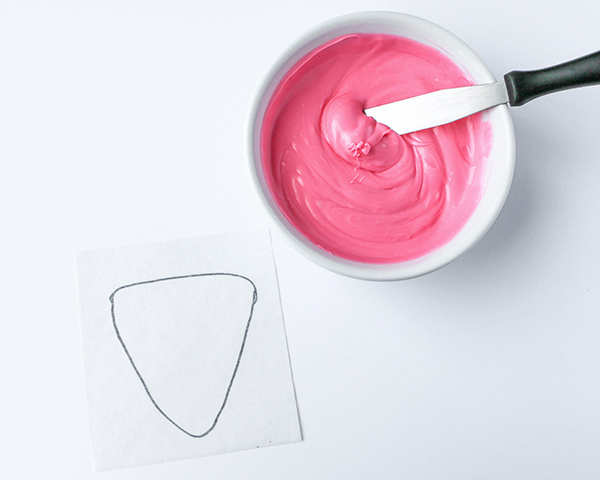 Use a small icing spatula to spread melted chocolate onto the triangle template. Work from the tip to the base of the triangle, leaving lines and ridges in the melted chocolate. The base of the triangle will be the outer edge of your petal. Spread the chocolate in a rounded, messy way, not in a solid line. This will give you more of a petal-y look. 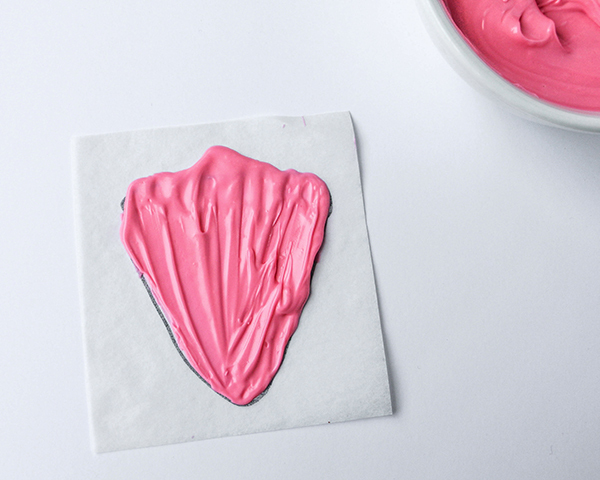 While the petal is still wet, place it into a bowl or plastic container to give it shape. 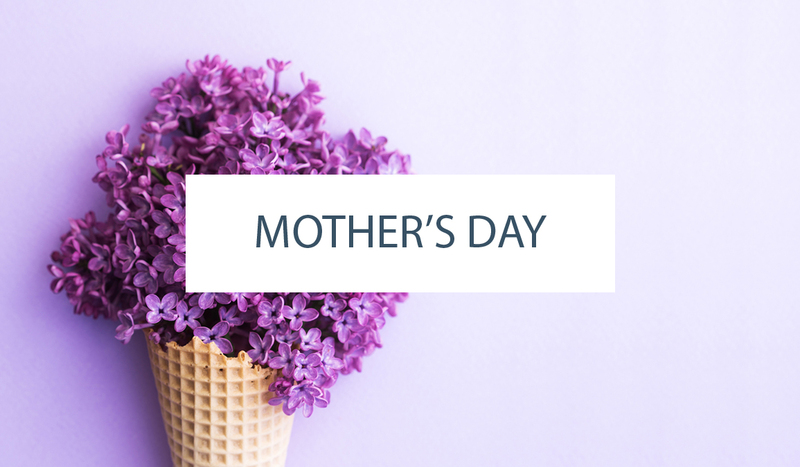 Use tape to help hold the petal into place while it dries. Repeat with the rest of your petals, making 6-8 in each size. It’s always a good idea to make an extra petal or two just in case one breaks as you’re assembling the flower. Once petals are completely set, peel away the parchment paper. 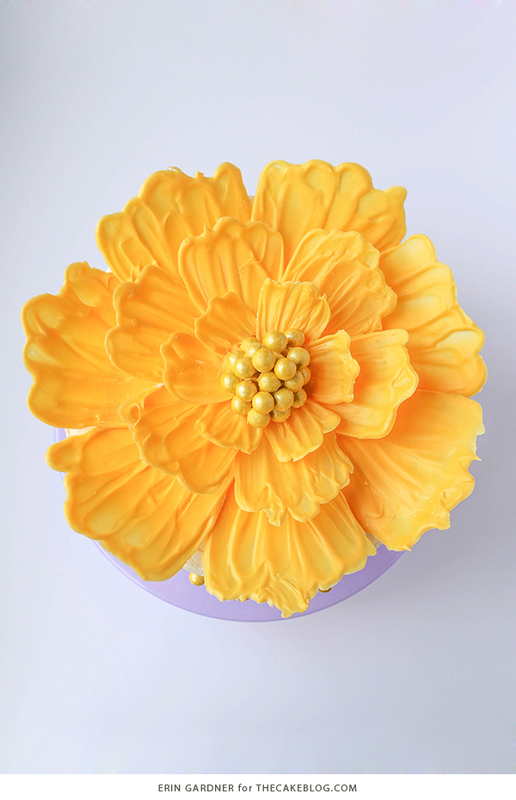 Place the largest petals in a circle on the top of a buttercream iced cake. 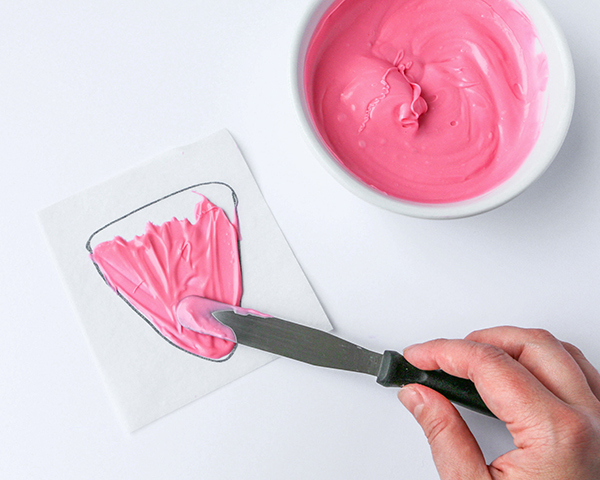 Fill a piping bag with a small amount of buttercream. 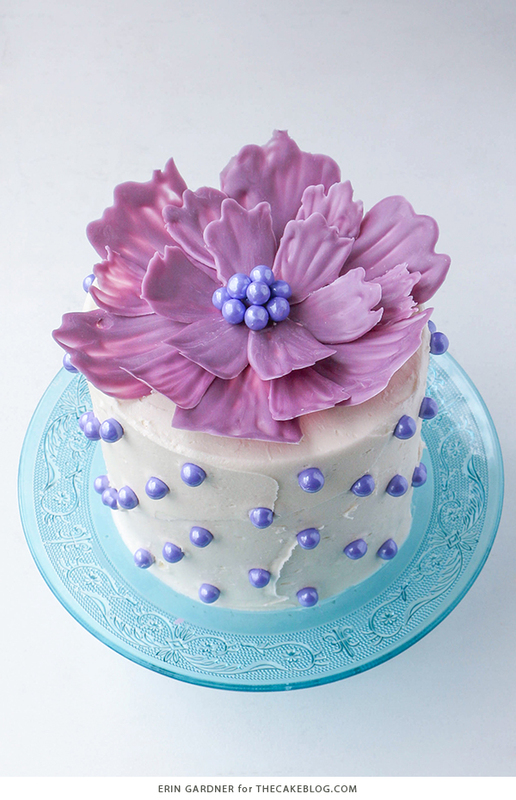 Feel free to color match your buttercream to your petal color if you’re concerned about the buttercream showing. I simply used the leftover buttercream from icing my cake. 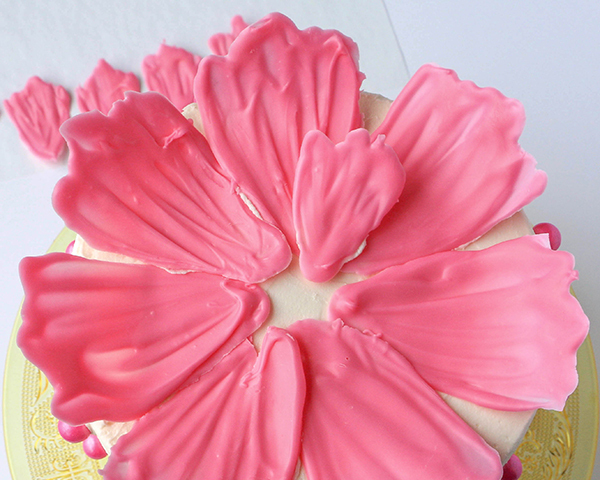 Use the buttercream to attach a second layer of smaller petals on top of the first layer. Repeat with more layers of petals as desired. Make your flower as full and fluffy as you like! Attach Sixlets to the center of your completed flower using a small dab of melted chocolate or candy melts. 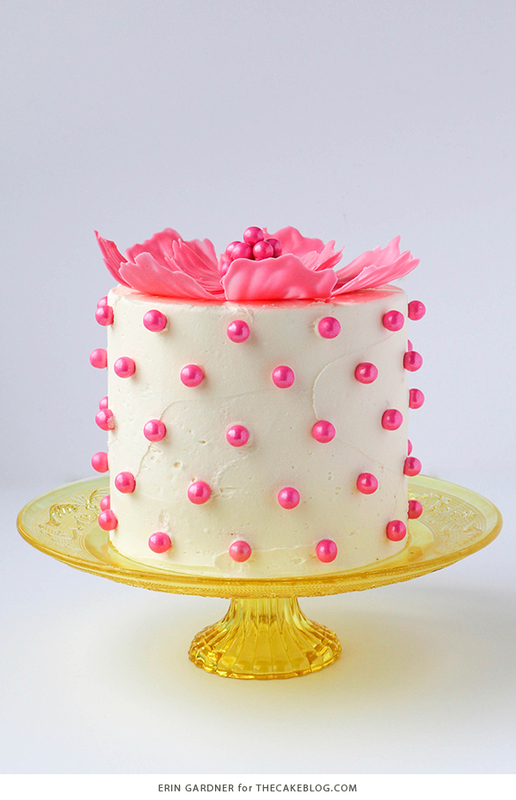 Use the rest of your sixlets to dress up the sides of your cake. Arrange them in rows or in a pretty Swiss dot pattern. Use this technique to make a mini chocolate flower to top a freshly iced cupcake or as part of a beautiful chocolate flower arrangement. 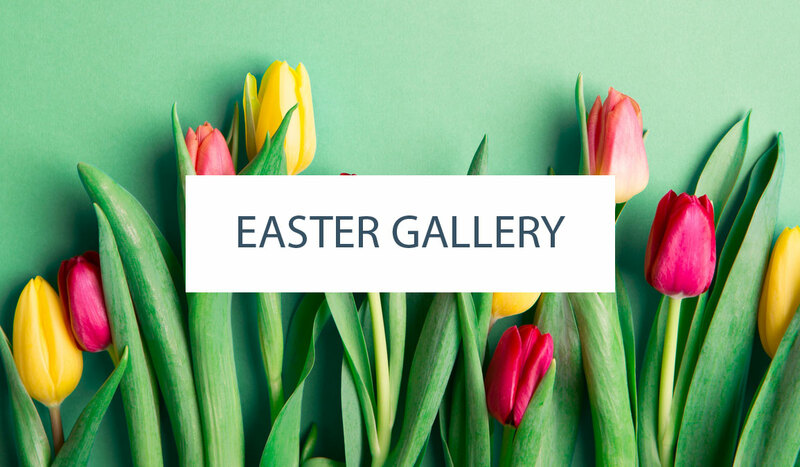 You can make chocolate tulips, chocolate daffodils, chocolate lily of the valley, sunflowers and more! Spring blooms come in all sorts of color combinations and sizes, so feel free to mix up the shades and get creative with your flowers! I. Am. Loving. That. I want to leave work immediately and make it! Thanks for sharing it! One question I have is when you say to tape the parchment when I put it in the bin to dry. Where do I put the tape? Tape goes on edge of paper parchment onto side of bowl to hold it in place. Love! I adapted this idea on cupcakes for a birthday brunch! So fun! Finally! Something that is doable for non-professionals, but that gives professional results! Beautiful! This is beautiful! I love doing fun creative things with melted chocolate. My children can arrest to several birthday cakes with the decorations made from chocolate! I will be making this for the top of my daughters wedding cake. Thank you. Can I use royal icing too? We’ve never tried this out with royal icing, but it has potential! Let us know if you give it a try! This looks amazing! The instructions make this look so easy and fun! I’m definitely going to have to try this! It looks like something that I could put on a birthday cake and have everyone impressed! This is beautiful and inspiring! I will definitely be trying this. Stunning! I thank you for sharing and your exquisite talent. I was so exited and now im a sad..i thought i finaly found the cake for my daughters Birthday. But id like to try it again if anybody could help me ..? Hi Angela! Sorry to hear your petals broke. Perhaps they were too thin and that made them extra fragile. If you give it another go, try making them a thicker so they’ll be more sturdy when you remove them from the paper and assemble the flower. Good luck! I also wish to express my thanks, as a grandmother and getting older it is a relief to find something that I might be able to accomplish. Also thank you for you careful instructions and photos of steps. How long does it usually take the petals to become hard enough to use? 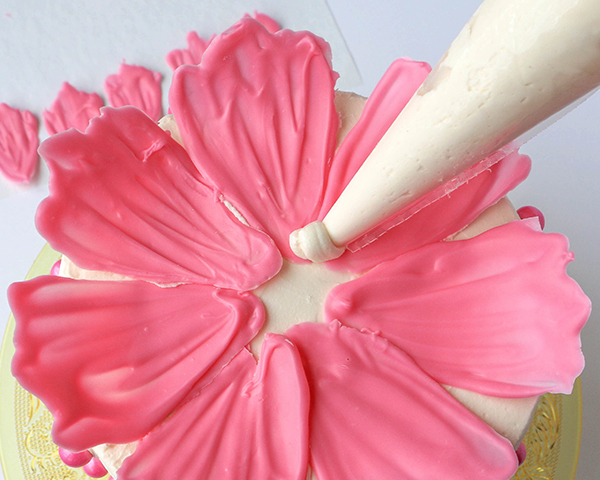 The petals will firm up pretty quickly, depending on how thick you make them. If needed, place them in the refrigerator to speed up the process. how many big petals did you use for an 8 in cake?? Beautiful cake love it!! thank you for sharing. 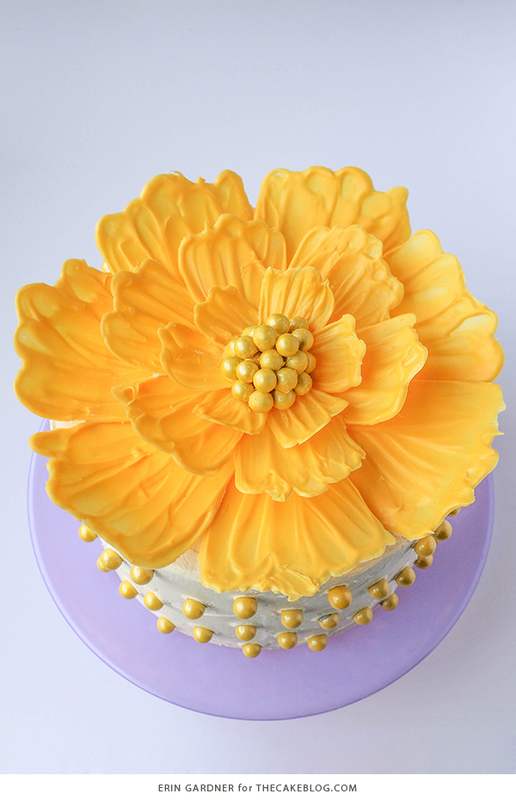 The yellow flower is on an 8″ round cake – so it will be the best guide for you. In all, it has 19 petals (three different sizes were used). Scroll back up and give it a look so you can see how they all fit together. Enjoy! Where do you find the pearl sixlets? Some grocery stores carry them, along with stores like Target and Walmart. There’s also an online shopping link for you in our supply list above. Enjoy! This is stunning, and the cake is pretty too! Do you use 3 or 4 layer cakes? Thank you for this beautiful design! I just made a cake using your idea and I think it is just lovely! I made this for my granddaughters’ birthday today and my leaves came out perfect but they wilted lol after I put them on still pretty though! !